It’s official, 2018 is Cardi B’s year. 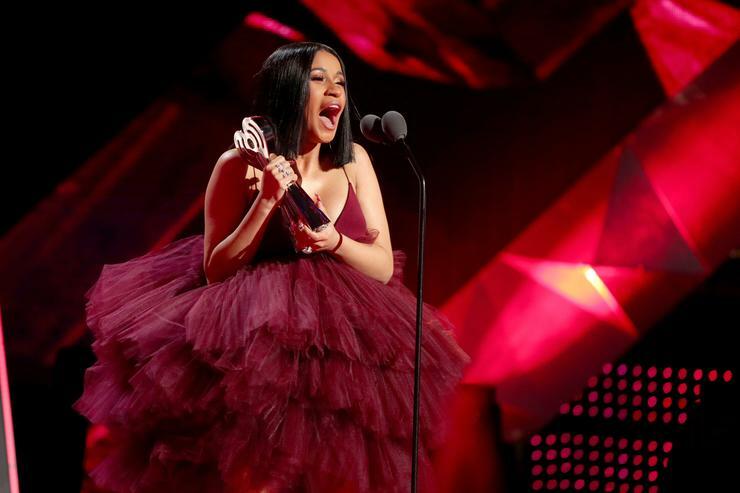 On Sunday night (March 11), the rapper received the Best New Hip-Hop Artist Award at the iHeartRadio Music Awards and accepted it like only Cardi B can. Dressed in a maroon gown, she took to the stage and was given the award by The Chainsmokers, before listing off all of the people she attributes her success to. At the top of the list was her publicist, her team at Atlantic Records and of course, friends, family and fans (her Bardi Gang). She wore muted jewelry to the event at The Forum in Los Angeles, but was sporting her enormous engagement ring from Offset. Looks like April is about to be full of new Cardi B music and a possible Offset collab isn’t far-fetched.